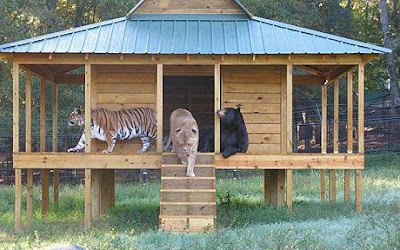 Rescued eight years ago during a police drugs raid in Atlanta, Georgia, the three friends were only cubs at the time and barely two months old. They had been kept as status symbol pets by the drug barons. They're natural predators of each other, but in this setting, they hang out as the best of friends. Makes me wish humans were as good at overcoming their natural differences. Rest of the story is here.